Tarantula! Probably the world’s scariest looking spider is the large, hairy and supreme tarantula, but the tarantula has a natural arch nemesis; the Tarantula Hawk Wasp. Up against a tarantula, the Hawk Wasp really has no competition; it’s like child’s play for the wasp. This particular wasp has one of the most painful stings to man, so imagine what it can do to a tarantula. So let’s compare these two insects. The tarantula is one of nature’s top dogs. It’s one of the largest species of spiders. The tarantula lives in dry deserts and grasslands. Its home is underground in borrows and the spider is mainly active at night. It has very few natural predators and feeds on other insects. Some tarantulas have been known to eat lizards, snakes, and even small birds. The tarantula will bite its prey with its fangs to inject paralyzing and digestive venom. Another defense the tarantula has is the hair on its abdomen. The spider will use its back legs to fling out the hairs. These hairs can be quite uncomfortable causing extreme itching and irritation to its predators. The venom released by a tarantula is enough to kill and take out the tarantula’s future meal. In perspective though, a tarantula bite is not very threatening to people. 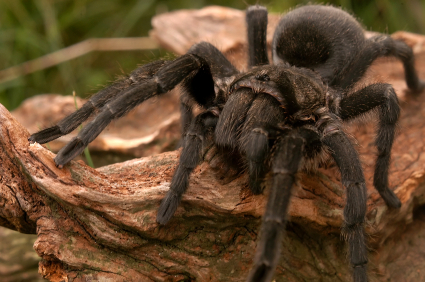 Its fangs sinking in can cause noticeable pain, but tarantula venom is not lethal and cannot cause very much damage. The Tarantula Hawk Wasp gets its name for being one of the tarantula’s few natural predators. The wasp has one of the strongest stings known to man. 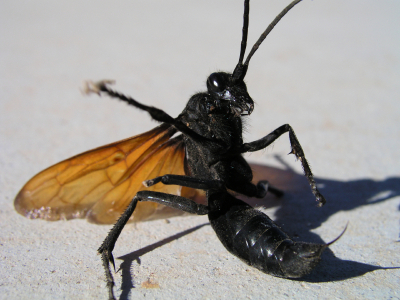 Right after the bullet ant, the Tarantula Hawk Wasp has the most painful insect sting. The Hawk Wasp consumes mainly nectar, but when it’s time to reproduce the wasp requires a tarantula host for its egg. The wasp lives in the same habitat as the tarantula, and so it will seek out a tarantula either in its burrow or when the tarantula is roaming around. After just one sting, the tarantula will become paralyzed. The wasp then drags the tarantula to its burrow where it lays its egg on the tarantula’s back. The egg will hatch and begin to feed on the live, but paralyzed, tarantula. Once the offspring has fully developed, it finishes off the spider and is free to enter the world, having already conquered one of the desert’s toughest insect predators. Our winner and undisputed champion is once again, the Tarantula Hawk Wasp! These spiders are huge. i am lucky that i am a bed bug exterminator. i would not want to be in the same room as these hairy spiders!